Lal Shah's Tomb and Ghazimeea Ke Durgah, near Benares. bl.uk > Online Gallery Home	> Online exhibitions	> Asia, Pacific and Africa Collections	> Lal Shah's Tomb and Ghazimeea Ke Durgah, near Benares. 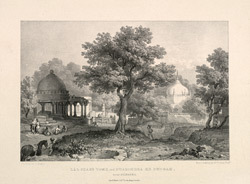 Plate 1 from the third part of James Prinsep's 'Benares Illustrated'. Prinsep (1799-1840), an antiquary and colonial administrator was assay master at the Benares Mint between 1820-30. The lithographs published in this collection were based on his original sketches of the various views of the 'holy' city of the Hindus. Of this plate he writes: 'Directly to the north of the town, a jheel or tank called Bukreea Koond, which is remarkable for the large quantity of stones collected in its neighbourhood, apparently the remains of some ancient temple overthrown by the Mahomedans...The tomb of Lal Shah, probably an officer of the Moghul army, is built of the fragments of a Hindoo temple or ghat...The white-washed Durgah behind Lal Shah's tomb, is the seat of an annual festival in honour of Saler Masood, surnamed Ghazi...Respecting the person of this saint, it is a much disputed point whether he was a Pathan, a Syud, or a relation and general of Sultan Mahmood'.